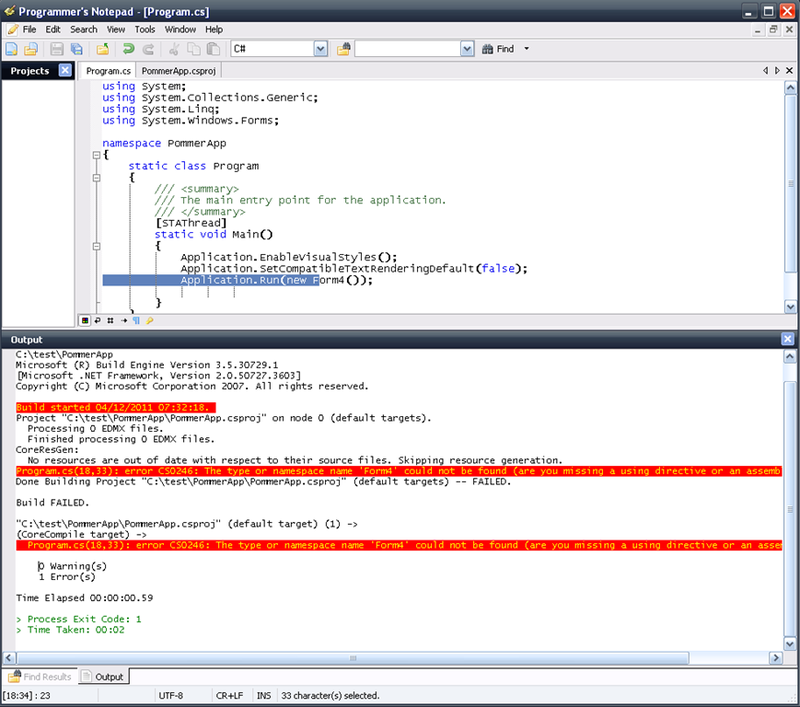 Sometimes, despite Visual Studio being an excellent IDE, you want to go the No VS route and hack your code in notepad. Perhaps you just want to make a quick change and its not worth firing up the full VS experience. Maybe you are only checking the code as a background time-filler in between other tasks you don’t want VS eating up your workstations resources all day. Perhaps most likely you’ll need to edit your code on a PC without VS (e.g. Netbook). A while ago I came across this excellent post by SecretGeek where he’s used a batch script to add compilation to the excellent Notepad++. I recommend taking 5 minutes to follow his instructions and get this working as it makes Notepad++ even more useful. Don’t forget you will need to change the .Net framework path in the batch file if you’re coding apps older than .Net 4.0. I’ve also copied the batch file and then modified it to work for solution files too, so I can compile the whole solution if required instead of just the project file. I’ve then added a second entry in the Notepad++ file (as per SecretGeek’s instructions) and a second shortcut key for this batch file. The only change required is to amend the “*. *proj” to “*.*sln”. 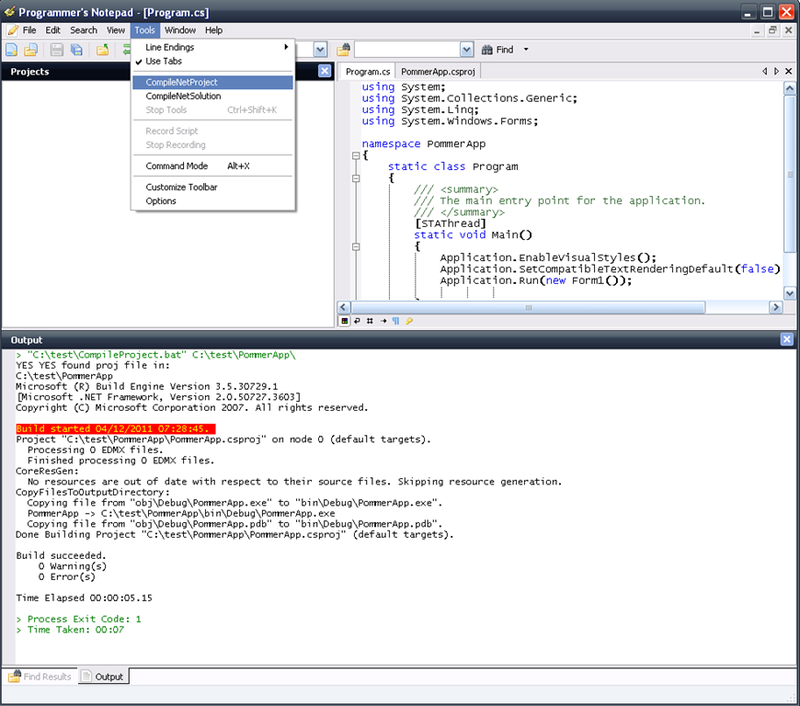 This change assumes that the project and solution files are NOT in the same folder though as this confuses the .Net compiler. As good as Notepad++ is as a notepad tool, if you need something a little more like a mini IDE then I recommend “Programmers Notepad”. 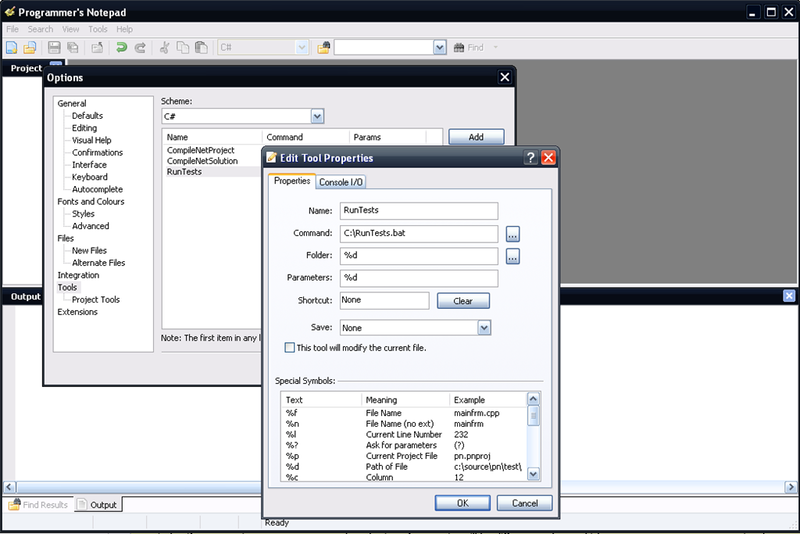 Not only is it an excellent lightweight Notepad like tool but it also supports “projects” and tools. By far the best feature though is that it parses the output from the compiler and highlights the results. Also clicking on the error will take you straight to the offending line of code (see screenshots below). 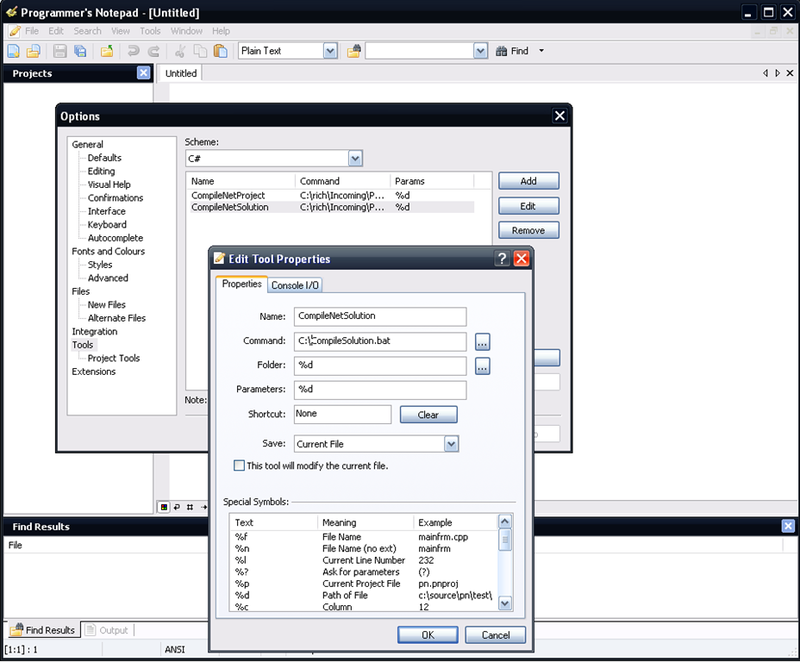 1 You will always run the tests whilst the unit test project code is the open active document in Programmers Notepad. 2 The test assembly name is the same name as the test project file. Using these assumptions we can code the RunTests.bat batch file to find the active document’s VS project file (*. *proj) and use its name to find the output assembly name in the bin\debug folder. Once we have the test assembly we can throw it at MSTest for it to run the tests. 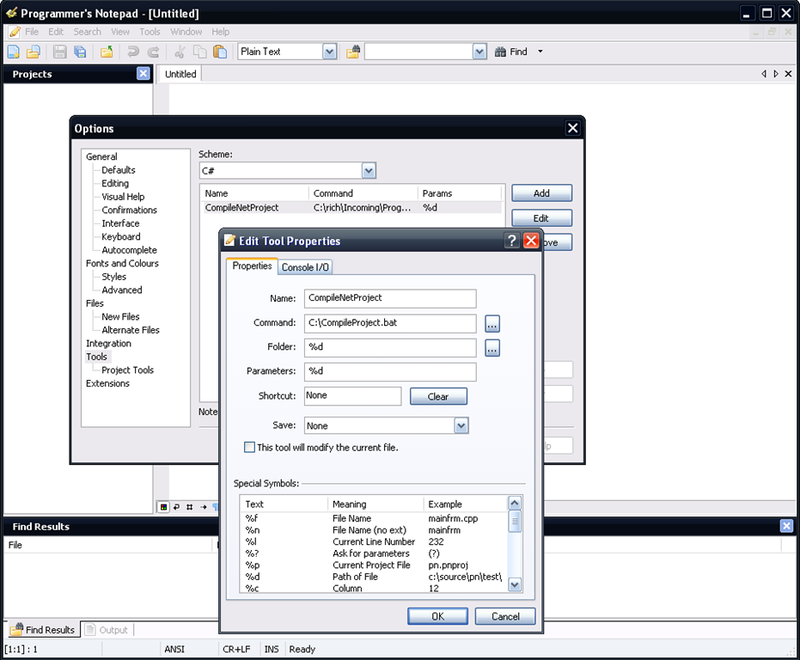 Assigning this new batch file to a Tool menu item in Programmers Notepad (as we did with the other batch files above) we can run the tests within Programmers Notepad and the test results will be output into the output window. Set MSTestPath="C:\Program Files\Microsoft Visual Studio 10.0\Common7\IDE\MStest.exe"